I'm not a big hard liquor drinker, leaning more toward a nice glass of red wine on most evenings. 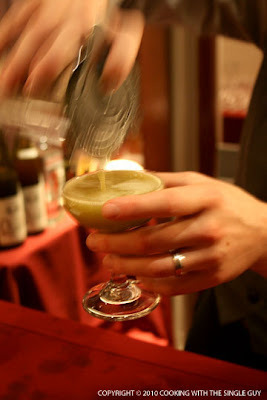 But sometimes the "Mad Men" mystique grabs me and I want a real man's man drink. And to me, that usually means whisky. 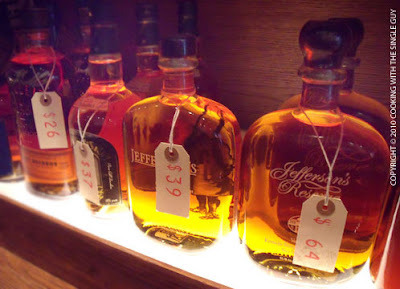 Looking for a nice starter bottle, I dropped by the Cask liquor store in SOMA near the Financial District. I didn't think of finding a store like this in this area of town, but it's like a super fancy corner liquor store. 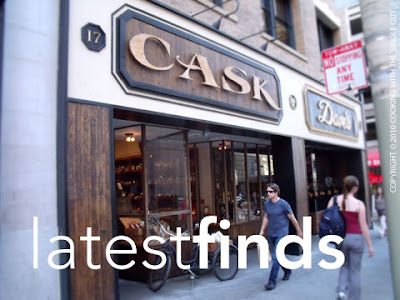 Cask was opened by the people behind the popular Bourbon & Branch and Rickhouse because customers kept asking them where they got their unique liquor. And that's the feel you get when you walk into this tiny shop. Everything looked special and boutique-like. 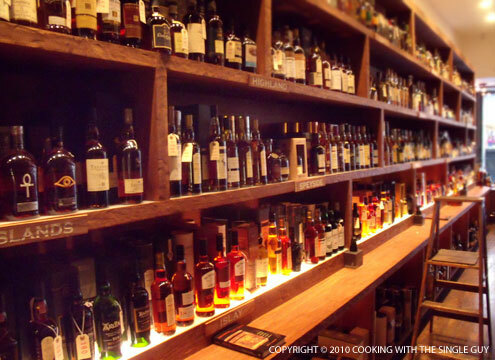 The wall is filled with beautiful bottles of hard liquor. One thing about whisky is that I totally love the amber color. It's just visually pleasing, and I admit I buy the liquor based on the color. 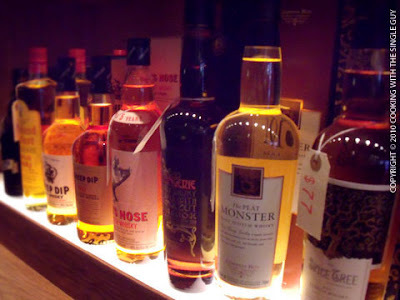 I ended up picking up a nice highland bottle of Scotch that I've been drinking after dinner for a few days. With Scotch, a little goes a long way. Cask is definitely a place for bartender wannabes and people who love all the ingredients of a really good drink. 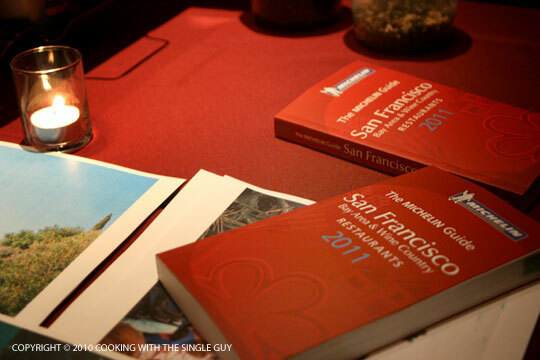 Yesterday, the Michelin folks released the fifth edition of its restaurant guide for the San Francisco Bay Area and Wine Country, and last night they threw a party for a whole bunch of industry folks and a few of the lucky chefs who were deemed worthy of the coveted Michelin stars. And I happened to be there, feeling kind of like the guy who sneaked in through the kitchen for a peek at the city’s fooderati. Officially, I was invited although they couldn't find my name on the list because I’m often invited as “The Single Guy” instead of my real name, and now I know how awkward it is to say “The Single Guy” out loud in line. 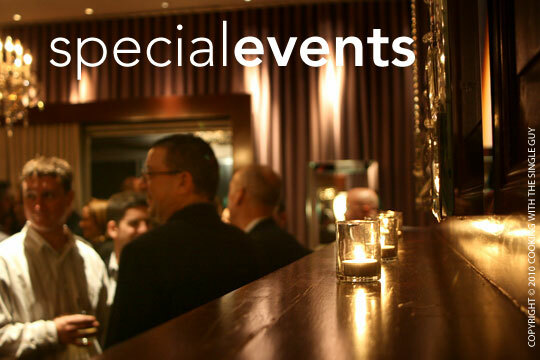 But I forgot all that as I walked down the corridor of a suite at the Clift Hotel and made a beeline to the bar, where several visiting bartenders from New York were mixing up some specialty drinks. I got something called the “Shanghai Maid” that was a refreshing mix of gin and cucumber juice, among other things. While the drinks came from a cocktail group from New York, the meal was produced by several underground supper clubs from San Francisco, such as Radio Africa, Spice, Cook with James, and forageSF. The passed h’orderves included plates of goat and liver pate, mountain mushroom crostini and some kind of interesting panna cotta and cheese combo in a spoon. 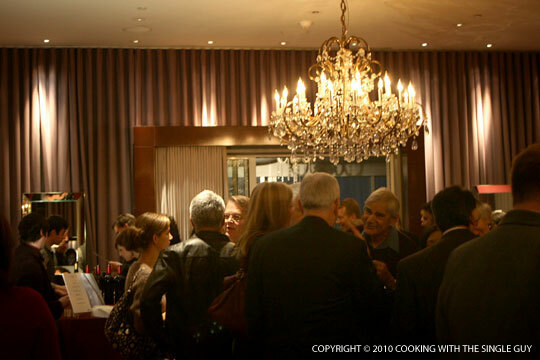 It was a night out for many of the city’s best chefs who hung up their chefs’ whites and put on their civilian threads to mingle with colleagues. I was mostly going around gawking at them. Among them were Chef Mark Sullivan, a partner of Spruce (1 star); and Chef Melissa Perello of the newly inducted one-star Frances. 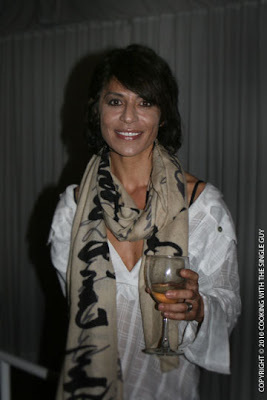 Looking so French chic with a San Francisco flair was Chef Dominique Crenn of Luce (1 star). She totally made my night when I introduced myself and she told me that she has actually read my blog! Yay! 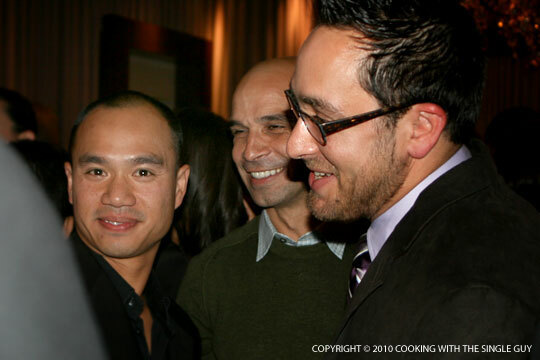 The man creating much of the buzz upon his arrival was (extreme right) Chef Christopher Kostow of The Restaurant at Meadowood in St. Helena in Napa Valley. The new Michelin Guide bestowed the ultimate ranking of three stars to Chef Kostow and Meadowood, making him only the second American-born chef to receive three stars. In the center is Jean-Luc Naret of the Michelin Guide and (extreme left) Chef Thomas Keller, who was the first American-born chef to achieve three stars for The French Laundry in Napa Valley and Per Se in New York. 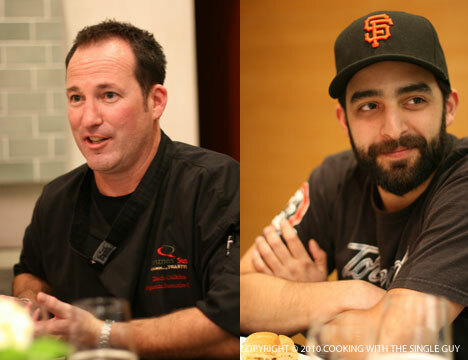 All the chefs seemed to get along like they were in some kind of special club, and nothing like the competitiveness you would imagine (I guess I’ve been watching too much Top Chef). Above are more chefs having a good time with each other, including (from left) Chef James Syhabout of Oakland’s Commis (the only East Bay restaurant that received a Michelin star), Chef Mourad Lahlou of Aziza (1 star) and Chef Kostow. 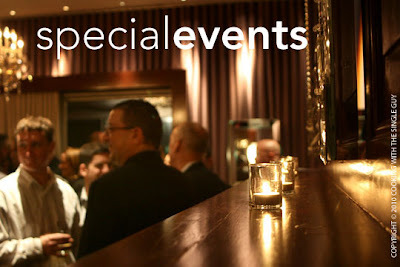 Lunch, M-F, noon-4 p.m.; dinner daily from 5 p.m.; weekend brunch, 11:30 a.m. to 4 p.m. 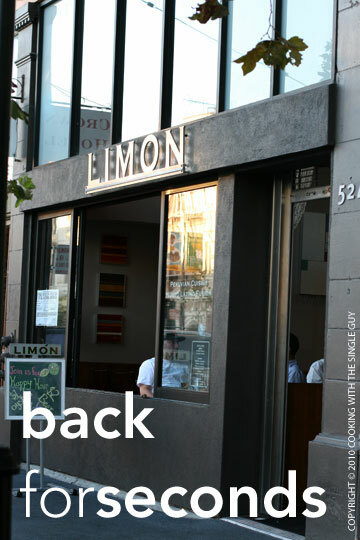 The Peruvian restaurant Limon is one of my all-time favorite spots in San Francisco, and when I started this blog back in 2006, it was one of the first restaurants I reviewed, giving it a stellar 4 stars. But my return to Limon was hampered by a fire that closed down the restaurant for more than a year. Then I was diverted when Owner/Chef Martin Castillo opened the casual but still feisty Limon Peruvian Rotisserie a few blocks away. 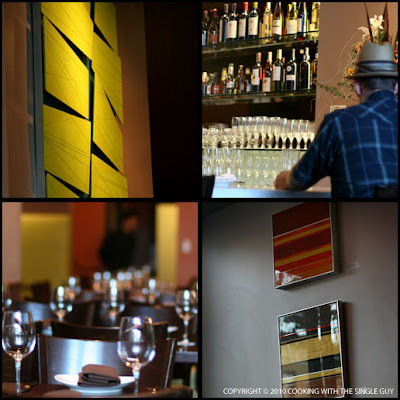 A couple of weeks ago, I finally checked out the refurbished classic on Valencia Street when my friend Margaret came for a visit from Hawaii. The restaurant didn't change much in layout, but many of its finishes and the bar were brighter and colorful. There were some new modern artwork on the walls, but it still had the open bar area and open kitchen were later in the night you can see the chefs fire up the dishes. 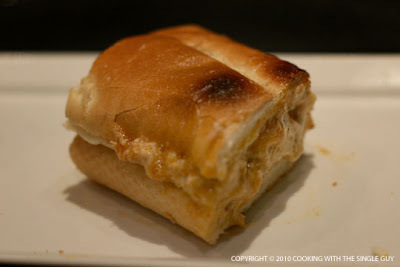 The menu also didn't seem to have diverted much from its original, but that's a good thing because while the smaller Limon Rotisserie has pleased regulars who missed the original Limon, the newer place still weren't able to offer many of the favorites. Margaret and I started with a ceviche. Limon has a delightful ceviche made with cream, but tonight we went with something reminiscent of Hawaii in honor of Margaret's visit and ordered the Ceviche Nikkei de Atun ($12), raw ahi tuna marinated with a soy sauce-infused leche de tigre. The soy based made this dish very similar to Hawaii's version of ceviche, aka poke (pronounced po-KAY). The flavors were just right, and there were a lot of meaty tuna to eat. The Peruvian touch came with the thinly sliced red onions and choclo, the large kernels of Peruvian corn. Margaret really loved trying this corn, which in the past I found a bit bland but this time was intensely sweet and warm. Margaret also never had an empanada before, so I ordered the Empanadas de Carne ($8), which were two crispy empanadas stuffed with braised beef, raisins, eggs, onions and served with rocoto sauce. This was also a hit for her, but I was less enthusiastic about it. 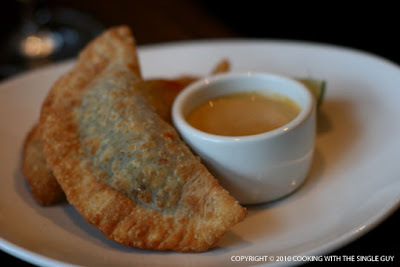 First off, I like my empanadas baked but at least Limon's deep-fried version came out light. I just wasn't excited about the filling. 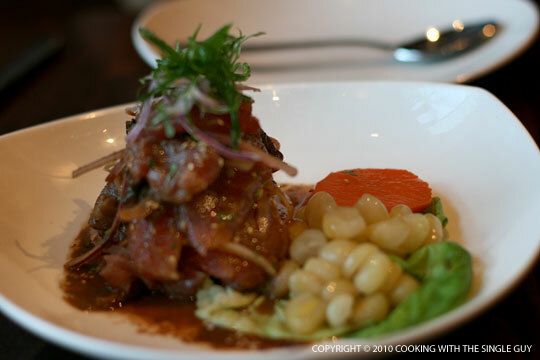 The braised beef had a mealy texture that reminded me of pounded red beans. I think the filling would have been better with ground beef and maybe some green olives. 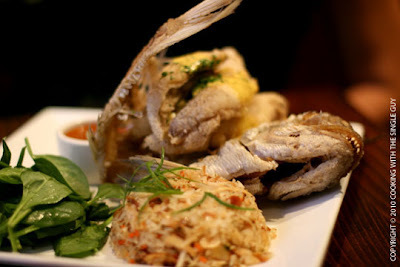 The Pargo Rojo didn't disappoint when it arrived, with the fillet portions of the fish nicely removed and deep-fried and then reassembled on the plate. Margaret loved it, including the rocoto-curry sauce. The only thing she didn't like was the coconut fried rice served on the side mostly because she thought it was odd to have the flaky coconut mixed in with the rice. I tried a bit and agreed that the coconut flavor could have come through the use of coconut milk instead of actually coconut meat. For me, I decided to go the red meat route. After visiting Argentina, I knew people in South America knew how to grill their meats. So at Limon, I ordered the Churrasco a la parilla ($22), or grilled ribeye. 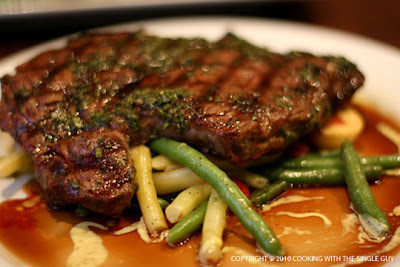 The big cut of meat was served with vegetables and crispy potatoes and chimichurri and red wine demi-glaze. The meat was perfectly cook, with a nice seared flavor from the grill and the meat allowed to shine with its minimal seasoning. The vegetables were OK and the potatoes could have been more crispy, but they're all just the supporting cast to the starring meat. 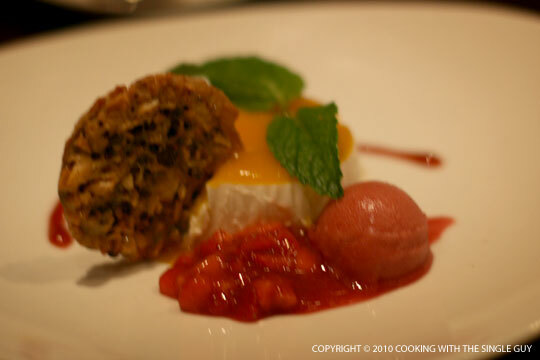 We ended our night with the Panna Cotta de Mango ($7.50). I wasn't expecting much from this because when I asked the waitress if the panna cotta was infused with mango, she said the mango was simply placed on top. So I just thought we'd get a traditional vanilla flavored panna cotta with fresh mango on top. For my super loyal readers out there, you're probably wondering what happened to the last Test Kitchen feature where I was supposed to cook a recipe from Food and Wine magazine. Well, the winning recipe, a Greek fish dish, required me finding a whole fish. And can you believe it's not easy finding a whole fish at the neighborhood store? I wasn't motivated to make that recipe. And then I let my subscription to Food and Wine expire because, if you look back at some of my previous Test Kitchens, I haven't been that excited about the results of the recipes in the magazine. Also, it might seem I haven't been cooking because my kitchen is/was in a state of upheaval. I had been talking about renovating my tiny kitchen this year, which is why I haven't gone on a foreign trip. I spent the last month getting quotes and price-shopping supplies. When I lined up the most affordable contractor, he totally flaked out on me. Now I have to start from scratch. It may be awhile before I get my kitchen renovated, so I thought I needed to get back into the Test Kitchen, even if it's in my rundown kitchen. Instead of recipes from magazines, each month I'm going to cook a recipe from one of the many cookbooks on my shelf. 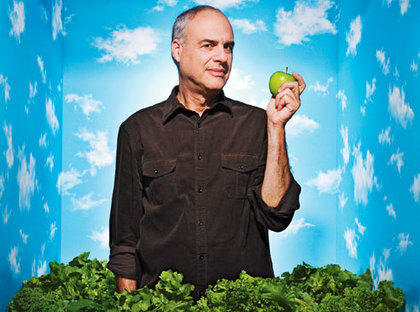 I'm happy to kick off my new and improved Test Kitchen with the latest cookbook from New York Times food writer Mark Bittman. 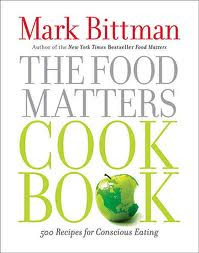 "The Food Matters Cookbook" (Simon & Schuster, September 2010, $35) is a thick book filled with more than 500 recipes that are good for your health and the environment. What this means is a lot of vegetarian recipes. But this isn't a vegetarian cookbook, there are a few meat and fish dishes. But everything is classic Bittman, simple recipe that's easy to make. So be sure to vote in the poll on the upper right corner with which recipe from Bittman's cookbook I should test. Then return next month to see how it all turned out. Photo courtesy of Readers Digest. 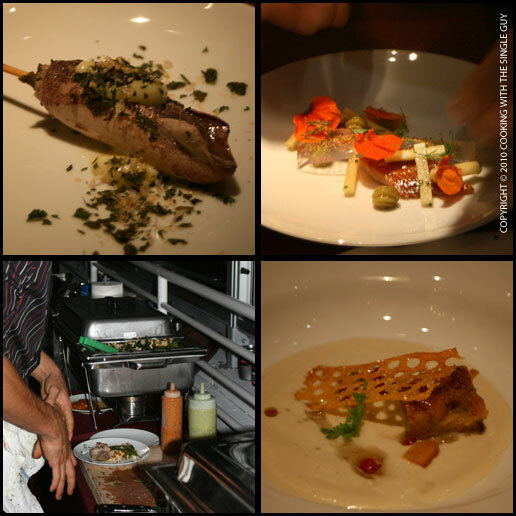 Reading my blog, you can probably guess that I'm not intimidated going to a fancy tasting menu or chef's dinner. 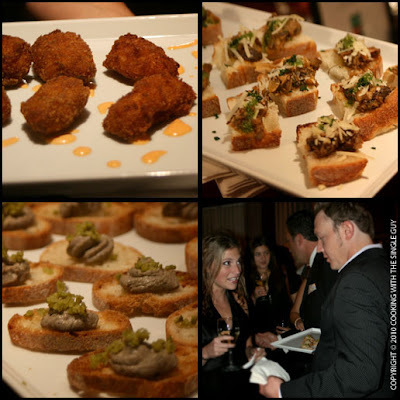 But life for the Single Guy isn't all sweetbreads and truffle-infused foam. It's not always caviar and petit fours. Which brings me to how I spent my Tuesday night this week. 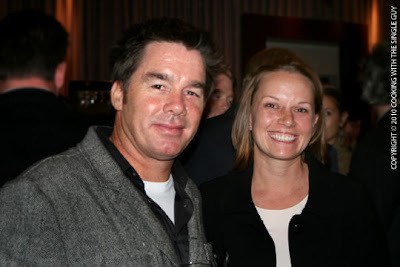 I was at a tasting dinner in a lovely SOMA loft in San Francisco. My host? Quiznos. 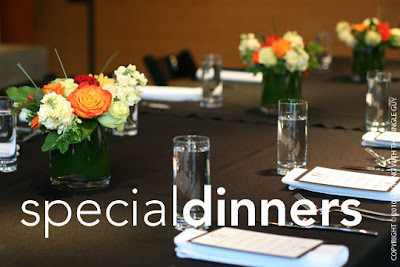 The dinner? Subs, subs, and more subs. Full disclosure: I've maybe eaten at Quiznos twice in my life. They have more creative subs than Subway, but it's not like a regular lunch spot for me. But when I was invited to check out the company's latest new subs on the menu, I was intrigued by the idea that the dinner would be paired with beer from San Francisco's own Speakeasy Ales and Lagers. 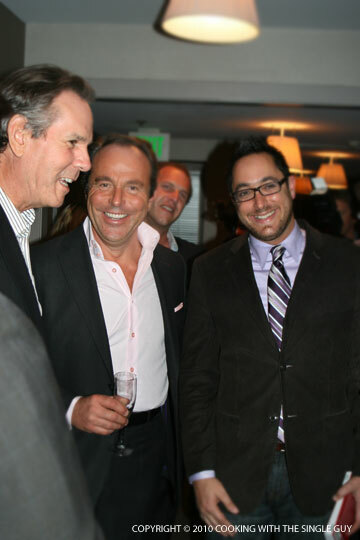 First off, here were the the guys guiding us through the dinner. On the left is Zach Calkins, the in-house chef at Quiznos who comes up with new menu items from the company's test kitchen in Denver, Colo. On the right is the guy from Speakeasy Ales, Kushal Hall, who's the lead brewer. Doesn't he totally look set for a "Fear the Beard" promo for the Giants? 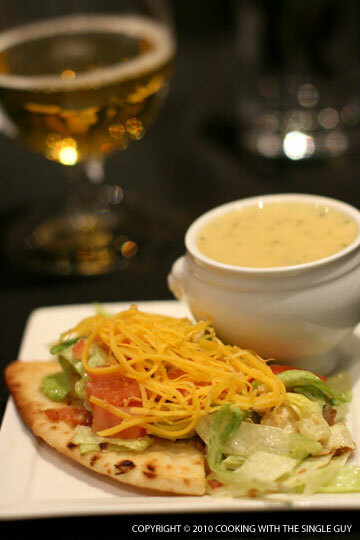 Dinner began with the Honey Mustard Chicken Salad and a bowl of Broccoli Cheese Soup. These are regular items on the Quiznos' menu and are fan favorites. I thought the salad was what you would expect (I could have done without the long shredded cheese on top and the flat bread was a bit tough) and the soup was tasty and creamy. This course was paired with a glass of White Lightening American Wheat that was a nice, light-bodied ale. Next was another classic, the Italian sub. And surprisingly with the first bite, I totally fell in love with this Quiznos standard. The light vinegar flavor with thinly sliced salami, ham and pepperoni, worked well with the nicely toasted bread. Not sure if the bread is this well toasted at the stores, but if it is, I would always get this. 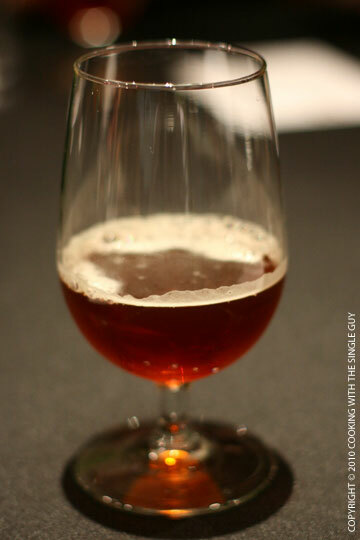 We washed the sandwiches down with a Big Daddy IPA, which was one of the night's favorite for me. 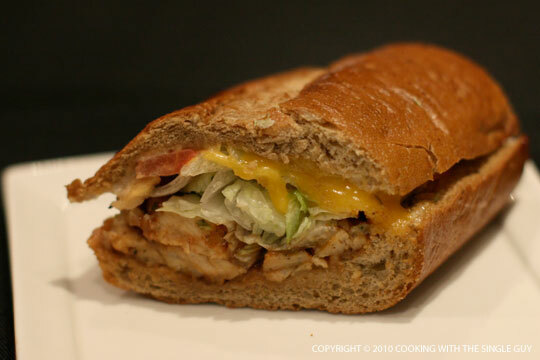 More new sandwiches: This is the BBQ Chicken Ranch, which Calkins said was inspired by the popularity of ranch dressings based on market research. This was good, but I felt the ranch dressing was overpowered by the barbecue sauce. Calkins says the ranch really contributes to the moisture rather than the flavor. 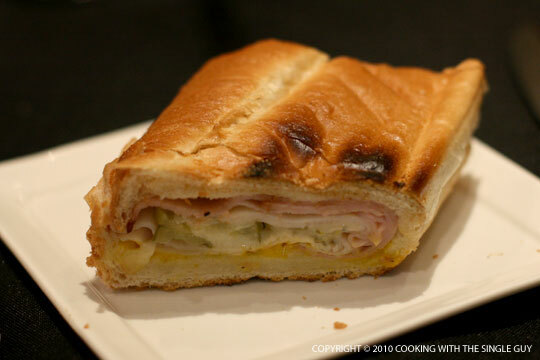 This is the Turkey Cuban Sub, inspired by the Cubana (which BTW is one of my favorite sandwiches). 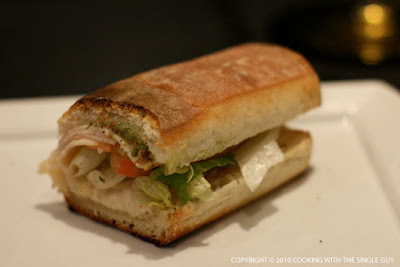 Instead of pork, Quiznos used the easier turkey (for the franchisees) combined with ham. Swiss cheese and pickles. I think the success of a Cubana comes in the toasted pressed bread, and at least tonight, the bread and preparation totally delivered. Hopefully this can be translated at the stores. 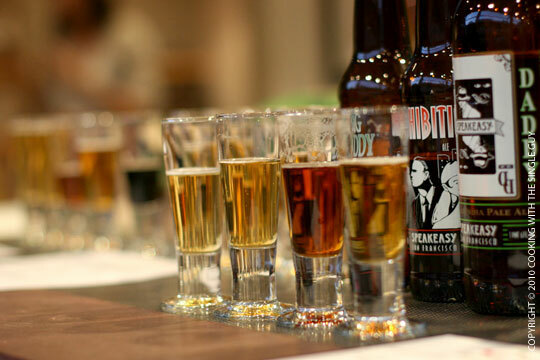 The previous two subs were paired with a Prohibition Ale, which is starting to get heavier as the nice progresses. This is the Buffalo Chicken Sub and I was excited about this because anything that sounds like buffalo wings surely must be a winner. But Calkins admits that they're still tweaking this menu, so it probably will be different at the stores. On this night, the color wasn't close to buffalo wings and the chicken texture was a bit lumpy. And the flavor was more like spicy buffalo wings. 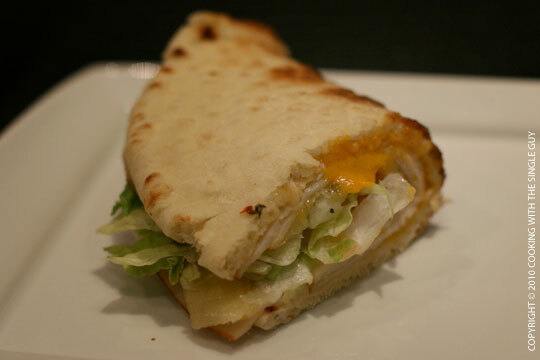 This is the new Smoked Chipotle Turkey Sammie (in a flat bread), and I like chipotle peppers but this lacked any punch. Maybe because my tastebuds got killed by the spicy buffalo sub. 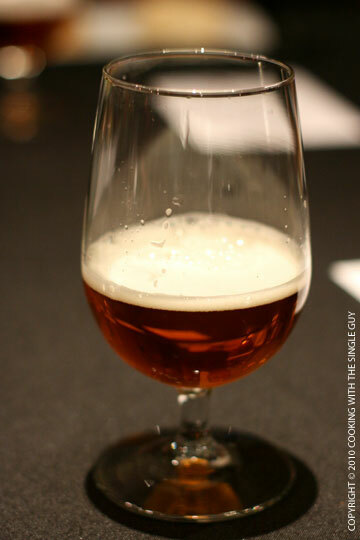 We paired the past two with a Double Daddy-Double IPA. Say that 10 times fast. The final two subs of the night actually weren't my favorites. 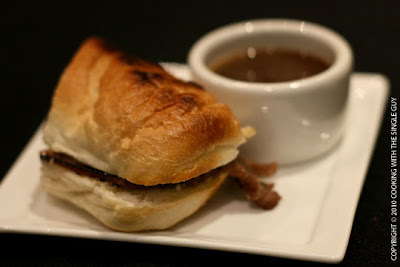 The French Dip Sub looked cute and sounded like a classic, but lacked much flavor. The dip, admittedly, was a bit thinner tonight than what it might be at the stores. 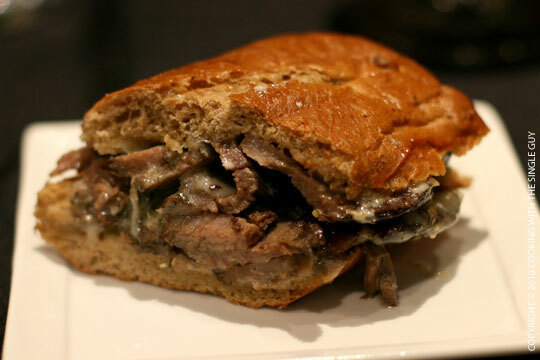 The final sub was the Prime Rib Mushroom and Swiss Sub with garlic aioli. This sounded good on paper and really looked hefty, but I was overpowered by the mushrooms. It had that musky mushroom flavor that can be off-putting. That totally ruined it for me despite the tender beef. 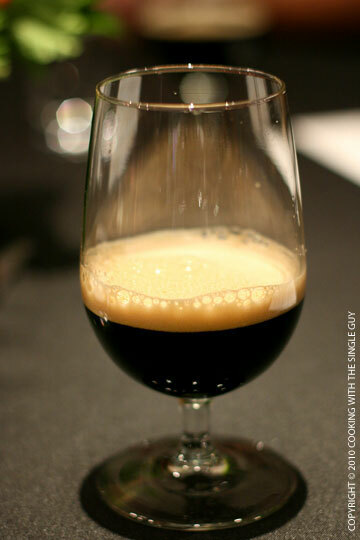 The night ended with this extremely heavy Payback Porter. 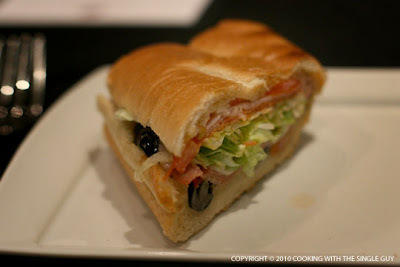 It was an interesting night of subs and ale/lager, and I learned a lot about how Quiznos try to come up with new ideas but balance the excitement of new subs with the practicalities of rolling it out to stores nationwide while maintaining quality. Quite a tall order. But from what I tasted tonight, they definitely are adventurous and are not afraid to shoot for the moon. I often travel far and wide for a good bowl of ramen. 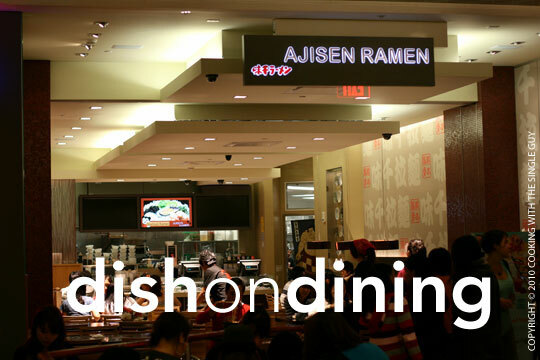 So imagine my pleasure when I saw a “coming soon” sign for Ajisen Ramen at the food court of the San Francisco Westfield Centre. I pass through this downtown mall often as my hub coming into the city from the East Bay, so dropping in for a bowl of noodles would be super convenient. Ajisen, a fast-food restaurant chain from Kumamoto, Japan, has opened several outlets in Southern California. They opened a Fremont location a few years back (not so convenient for me) and the San Francisco outlet is supposedly run by a franchisee. Despite being in a food court (on the Nordstrom side next to Panda Express), the location near the BART and MUNI Powell Station makes me think of what ramen stands must be like in Japan — often near or in train stations. A quick satisfying bowl of noodles is a great way to fill up and continue on your journey. 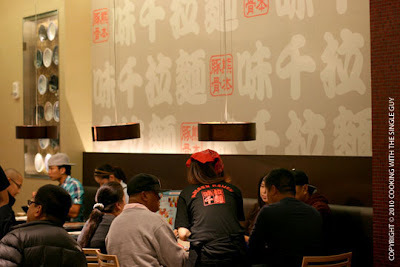 Since Ajisen opened at the San Francisco mall in August, I’ve visited a few times trying the various soup bases for its ramen. The décor has a clean and playful feel, with what I assume is the Ajisen mascot being the Hello Kitty-wannabe plastered on the wall and sometimes on the side of the bowls. Even though it looks like any other food court restaurant, it works a bit differently. You have to be seated like at a sit-down restaurant and then order off the menu with a waiter. The counter, which looks so much like where you would order, is strictly for people wanting their noodles to go. Shoyu Ramen ($8.95), comes with three slices of cha shu (the tender pork), half a hard-boiled egg, bamboo shoots, fish cake and a piece of nori on the side of the bowl. Since this was my first ramen bowl at Ajisen, let’s talk about the noodles. They were straight and not really crinkly, but had a nice texture and give. It wasn’t amazing or distinctive, but was cooked well. 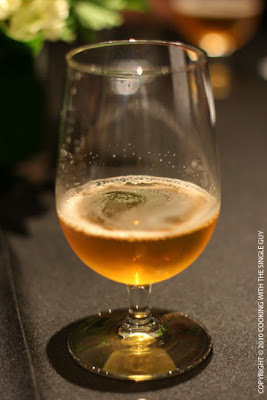 The shoyu broth tasted weak with very little body or complexity. With the ramen, it was OK, but without the ramen the soup alone was slightly salty. The cha shu was tender but didn’t have much flavor. Ajisen Ramen ($7.50), comes with three slices of cha shu, shredded cabbage, egg and konbu. I figured this might be the special ramen, but the price would make you think otherwise. What’s distinctive about the Ajisen ramen is the broth, which had a milky look that reminded me of the special pork broth (tonkotsu) at some ramen places. There were amber specs that may be sesame seeds. I actually enjoyed the full body of this broth. 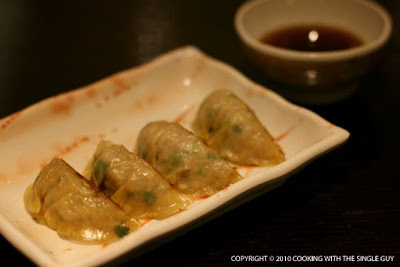 During one visit, I did order a plate of gyoza ($2.95) to see what they were like. The gyoza were tightly wrapped using a thin wrapper but I felt the bottom edge weren’t as crispy as they could have been. The filling was nothing to marvel over. 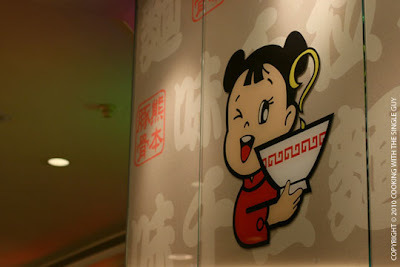 I returned another time with my friend Ken and ordered the Beef Curry Ramen ($9.75), just to try something different. (Other unusual ramen specials include a pork ribs ramen.) 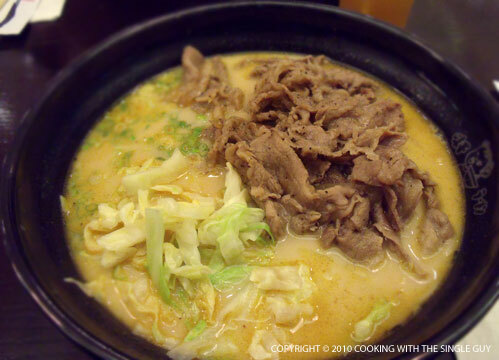 The beef curry ramen was topped with thinly sliced beef with a very subtle curry-flavored broth. The curry didn’t seem very spicy and was pretty tame, although I did enjoy the thinly sliced beef. 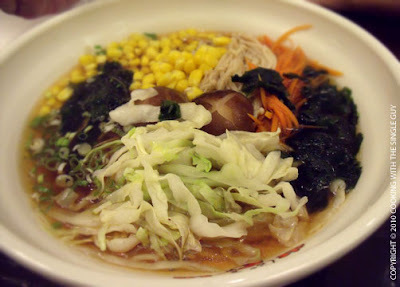 Ken ordered the Vegetable Ramen, which actually came topped with a variety of vegetables. Ken said the broth seemed a bit light for him, so he wasn’t very impressed. To me, it looked like the kind of vegetable dish a hotel would make at a banquet to please the non-meat-eating guests. There seemed to be little thought into making this bowl more special. Miso Ramen ($8.50), comes with the cha shu slices, egg, shredded cabbage and seaweed. This was the latest bowl of ramen I tried at Ajisen. I’m a big fan of miso ramen, just because I love miso soup and I feel the soy paste gives the broth more body. Ajisen’s version was good, but again the broth was on the subtle side with just a mild miso flavor, like they used white miso with very little punch. Side note: All the ramen comes with a ladle for a spoon, which looks interesting but I found a bit difficult to eat with. IMHO I felt it was too big an instrument to be bringing up to your mouth and would have just preferred a large spoon. 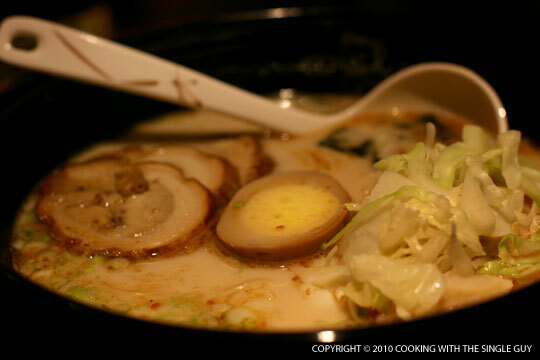 Ajisen definitely has a large variety of ramen to try, and they have quick and simple service. 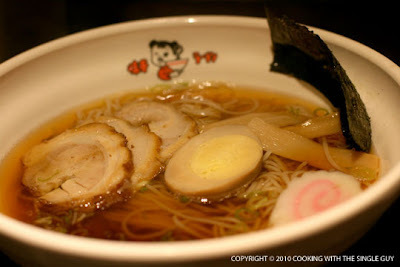 But the ramen is nothing spectacular and the broth can sometimes be light and mild. 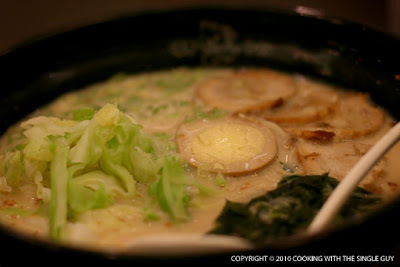 The quality of the ramen is probably on par with some of the ramen spots in Japantown, making Ajisen more a convenient and central spot to satisfy your hunger for ramen rather than to be transported to ramen nirvana. Goodbye to the Season's Figs?